I’m pretty excited about this one. 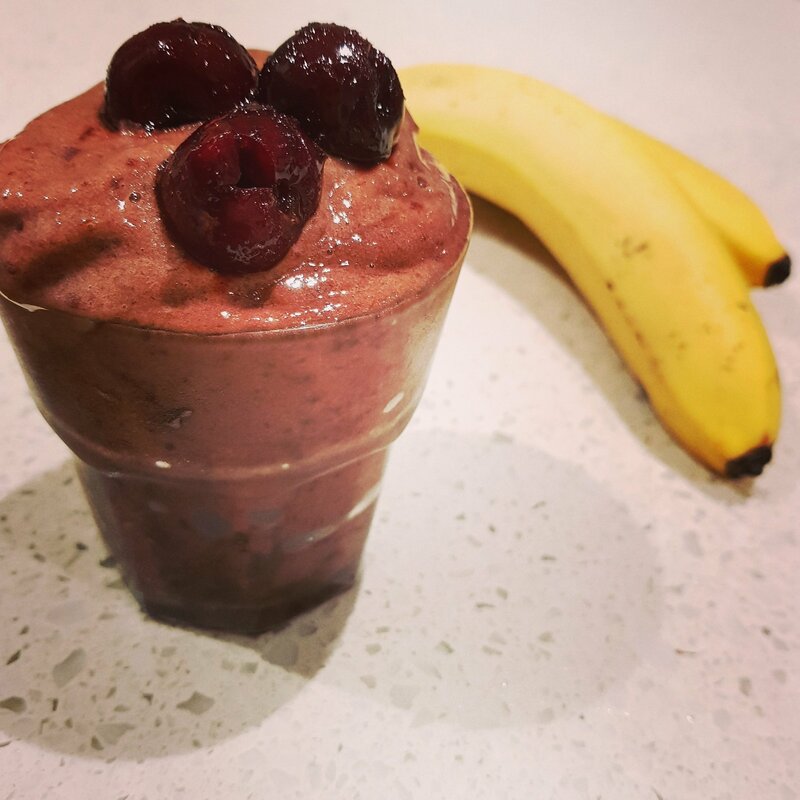 A truly whole food plant based no oil recipe that tastes so delicious! Don’t be put off by the number of ingredients, many of these ingredients are pantry items that will last and can be used for many other whole food plant based desserts. 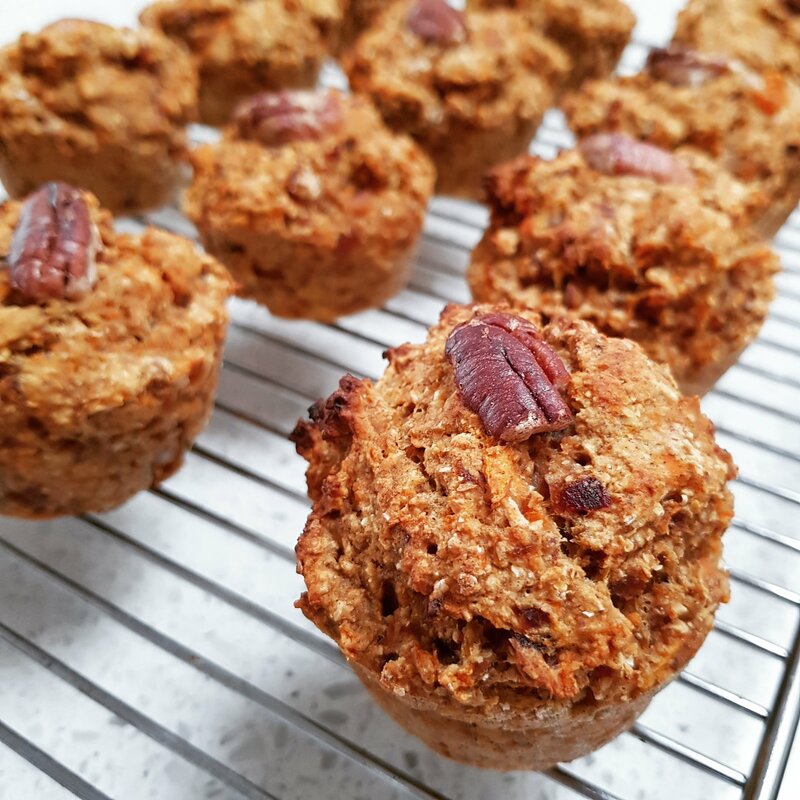 These muffins also make good on-the-go breakfast options. Save a tablespoon of carrots and put remaining fruit and vegetables through a food processor until finely chopped. Add the processed fruit and vegetables and the saved tablespoon of carrots into the wet ingredients. Add all wet ingredients to the sifted dry ingredients. Spoon into non-stick silicone muffin tray (makes 12). The silicone muffin tray is important for no oil baking or everything sticks. 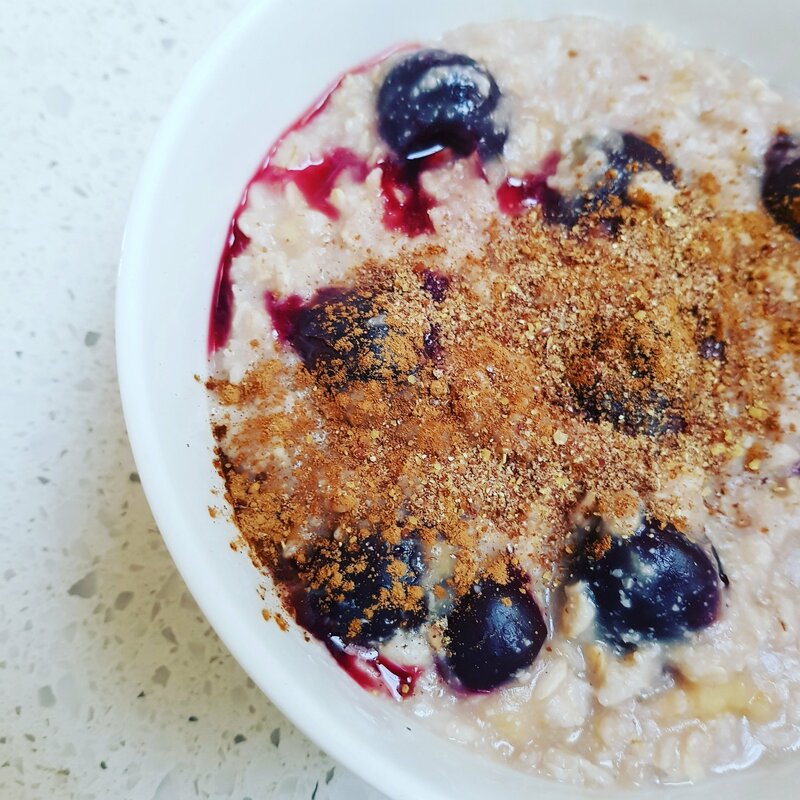 Oatmeal is a favourite breakfast option during the colder months. It’s a lovely ritual stirring the oatmeal in a saucepan and watching it get creamy, and these cherries add a pretty pink to my warm breakfast. 1 banana, mashed. The riper your banana, the sweeter your oatmeal will be. Combine oats and water in saucepan and cook over low heat. Add mashed banana and stir continuously. Stirring helps make a creamy oatmeal. As the oatmeal comes to a consistency that you like, add the frozen cherries and cook for another minute. Serve and sprinkle flaxseed and cinnamon on top. 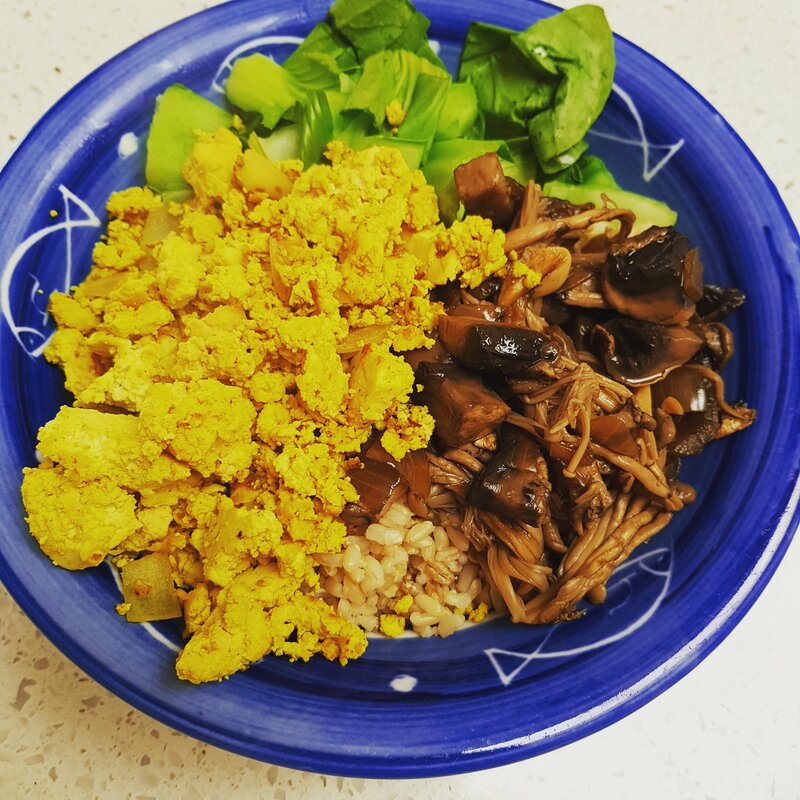 This is a great way to pack lots of protein into your buddha bowl. 3. Add remaining seasoning. Sautee until browning starts to occur on tofu edges. *You must use a non-stick pan if you are cooking the no oil option. Blitz all ingredients in a good processor. I like to save half the cherries and put them in at the end and blitz for a few seconds. This adds a bit of texture to the nice cream. 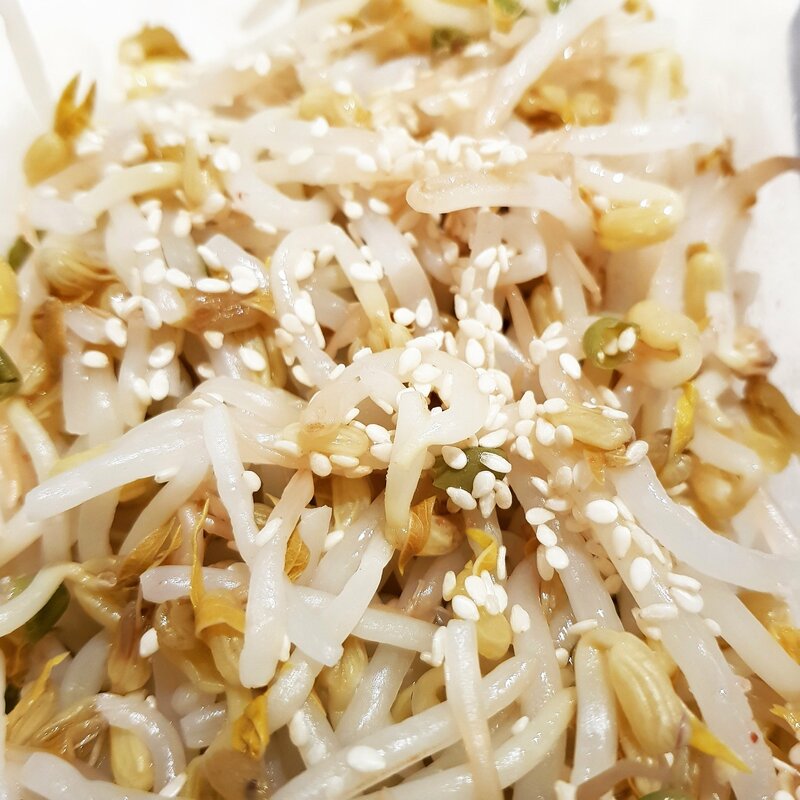 These beanshoots are very quick to prepare and a great addition to buddha bowls, or just eat them on its own as a snack. They can be served cold. Submerge beanshoots in a saucepan of salted boiling water and boil for 1 minute. Drain beanshoots in a sieve then run under cold water. Squeeze beanshoots to remove any excess water. You may wish to toss them around in a clean dry tea towel. In a bowl, add salt to taste, sesame oil and sesames. Toss and serve. 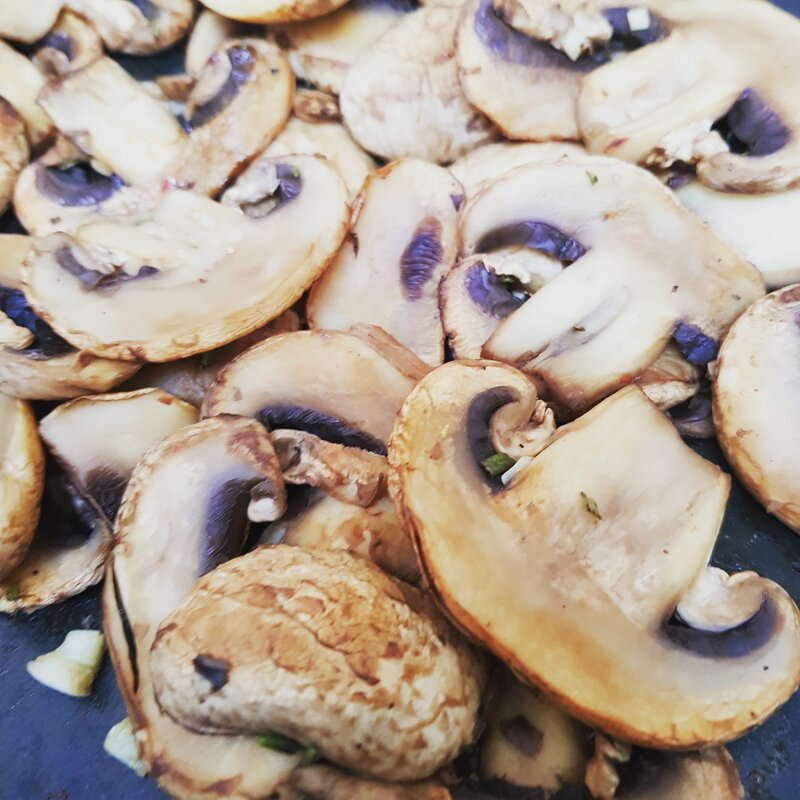 I love the meaty and umami flavours of mushrooms. 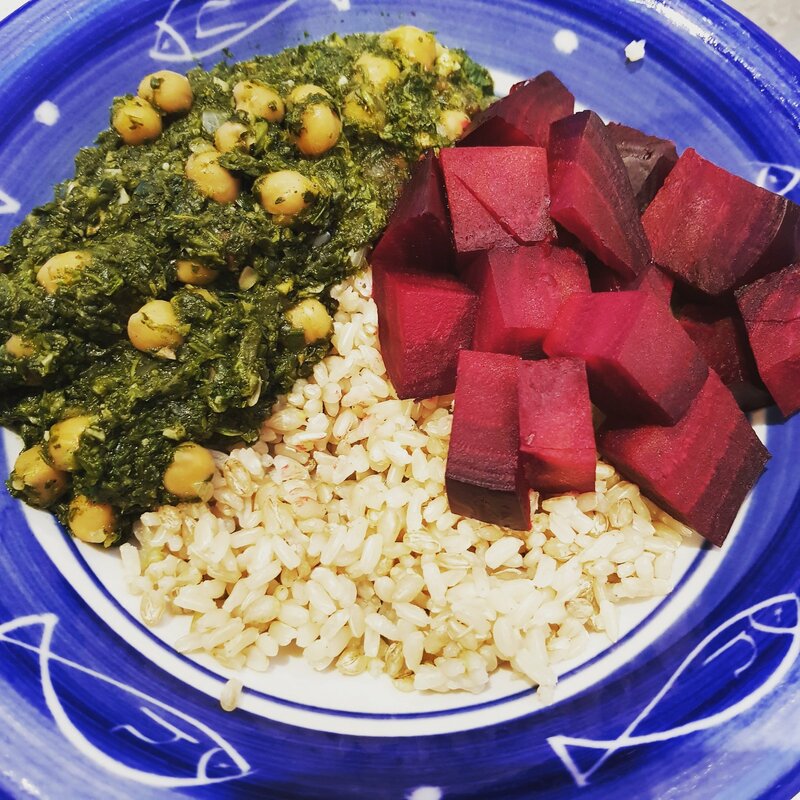 This is a great winter addition to any buddha bowl. If you are not able to find a range of mushrooms, you can make this from one type of mushrooms. Sautee onion in with some broth until translucent. Add garlic and ginger and sautee for a minute. Add all mushrooms except for dried shitake, and soy sauce. Sautee until mushrooms have reduced. Add enough broth to cover mushrooms and add shitake. Simmer for at least 15 minutes but you can simmer for an hour to bring out all the flavours. Just top up enough stock. I love making this when I already have my oven turned on for another baked item. A great buddha bowl addition. Wrap washed beetroot in foil and place in oven 180C. This often works well when I’m already cooking something else. Turn oven off after 20 minutes. Leave beetroot in oven to continue slow cooking. When beetroot has cooled, take out of oven, unwrap foil and remove peel. You can do this by gently rubbing on the peel which should slowly slide off. 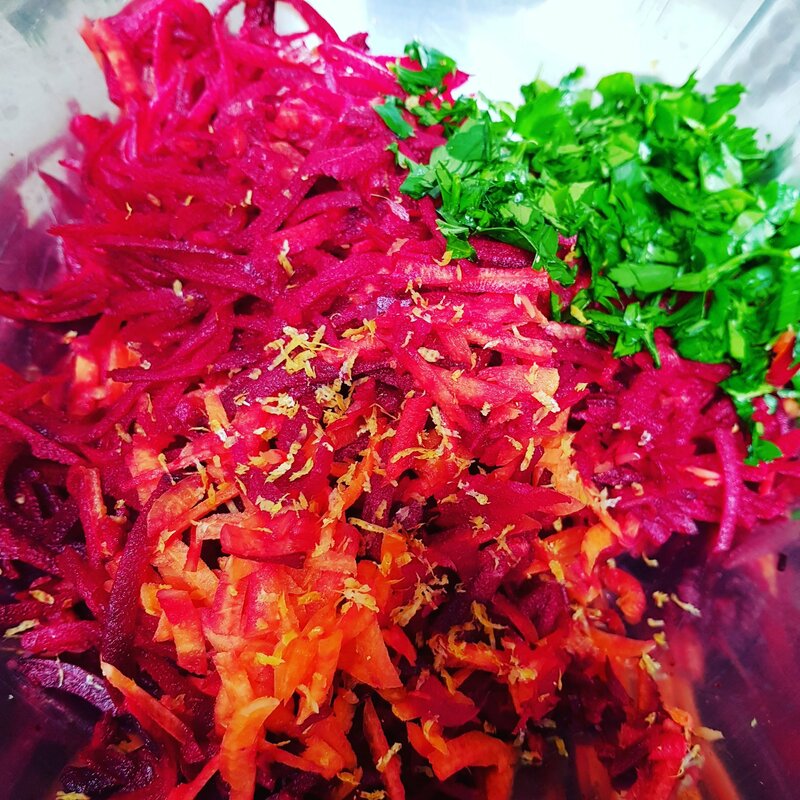 Chop beetroot into cubes and serve in a buddha bowl or salad. 1. Shake lemon juice and mustard in a jar to make a dressing. 2. Toss vegetables, lemon rind and herbs together with dressing. 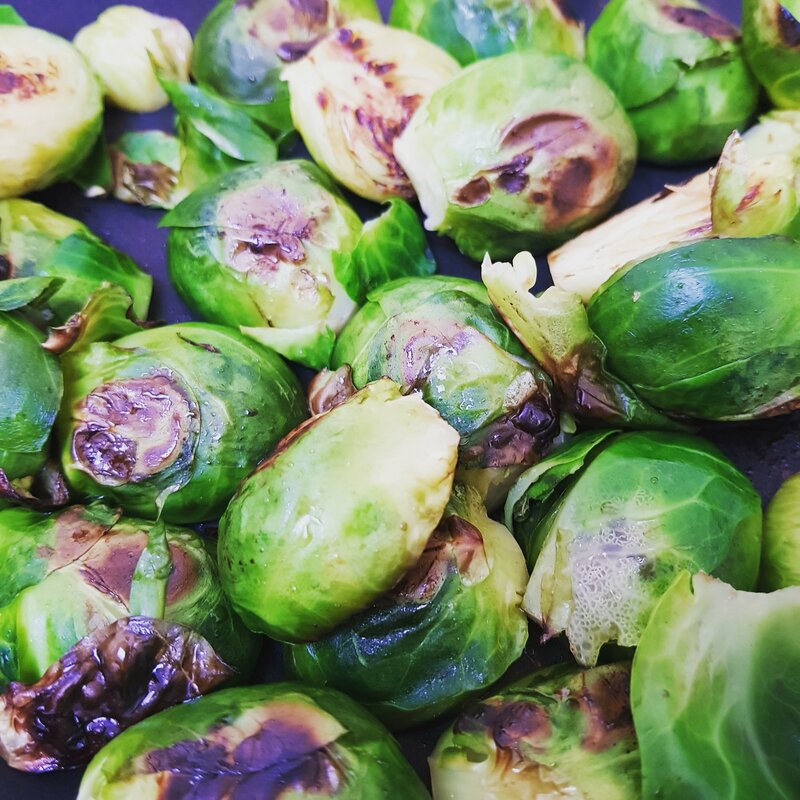 These seared brussel sprouts are a great addition to any buddha bowl. Trim ends of brussel sprouts then cut in half. Place cut side on a hot pan then turn down heat to slowly sear*. Cover the pan. Flip brussel sprouts when one side is brown. When both sides are brown, season with salt and half a tablespoon of apple cider vinegar to taste. Quickly toss around in pan then serve. *You must use a non-stick pan if cooking the no-oil option.